Made with authentic Swiss clay, these fireproof ceramic pots are your way of really bringing home a little piece of Switzerland. Take part in a tradition that never gets old! Size: 2.65L / 2.8 Qt. 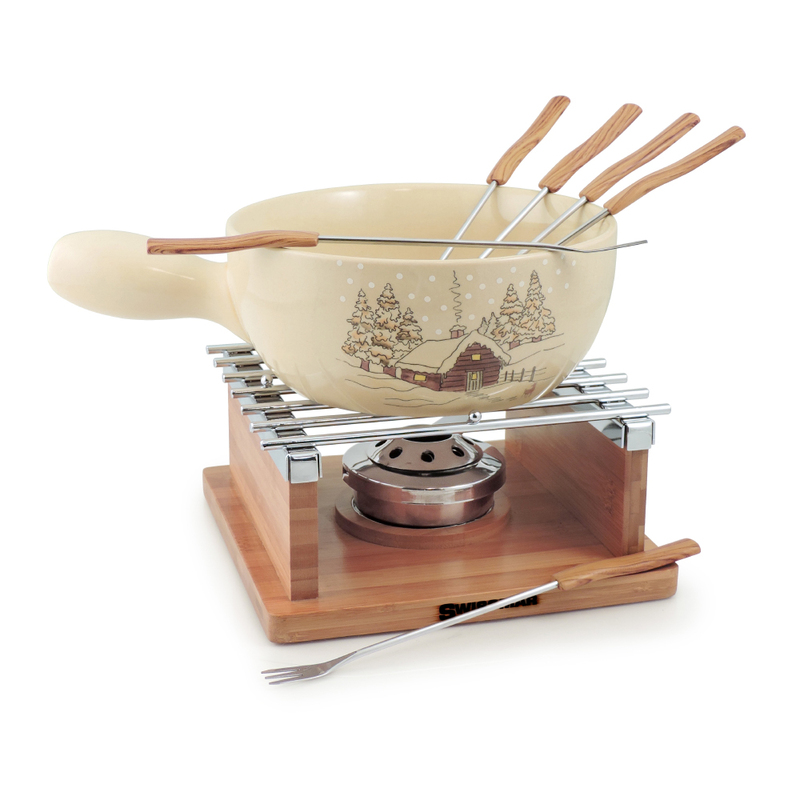 Swiss Traditions Series brings authentic Swiss fondue sets for an authentic Swiss experience. Cheese fondue is a traditional Swiss dish, fun to serve and enjoyable to eat. This 9 piece ceramic cheese fondue set includes a 9 inch black ceramic fondue pot, a traditional wrought iron rechaud, six heat resistant 11 inch stainless steel 3 tine fondue forks with dark wood handles and an 8 hole fondue burner. The ceramic pot is made with authentic Swiss clay and has a 2.8 quart capacity. It is safe for use on cook top, in oven, in microwave, and with traditional fondue fuelled burners. Swiss traditional ceramic cheese pots are ideal for cooking at low heat, the larger pot keeps the temperature from getting too hot and burning the cheese. These pots show "crackling" - an important process that allows the glaze to expand during heating. Although they may eventually become discolored after several uses due to food particles entering the cracks, this is perfectly safe and normal.